These beautiful garden paintings were created by my first graders. 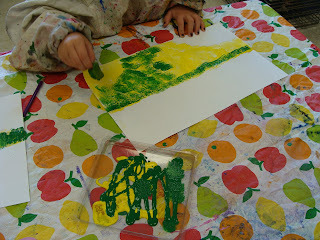 Everyone had great success, simply by following along, step by step, while adding their own touches. 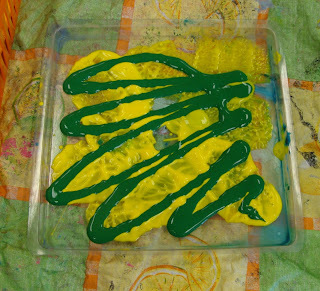 This project also combines several painting techniques, so students get an introduction to various painting media and experiences. They LOVE this video and I highly recommend it! 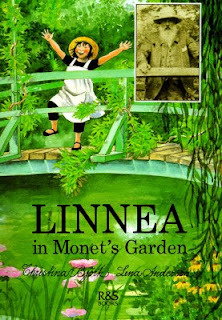 It tells the story of a little girl who travels to Monet's gardens. It is animated with shots of the real gardens interspersed. There is a book version, but the video is so much better! Hand out white paper and pencils. Have students Draw a horizon line across the paper and part of a pond. I explain that we are only drawing a very small portion of the pond- maybe just the corner. Put some yellow tempera in a tray and have students "hop" their sponge pieces across the horizon line and fill in the grass area. I remind them that they do NOT want the entire area solid. Some white showing through is fine. Also, remind them not to use the sponge as a brush, swiping it across the paper. 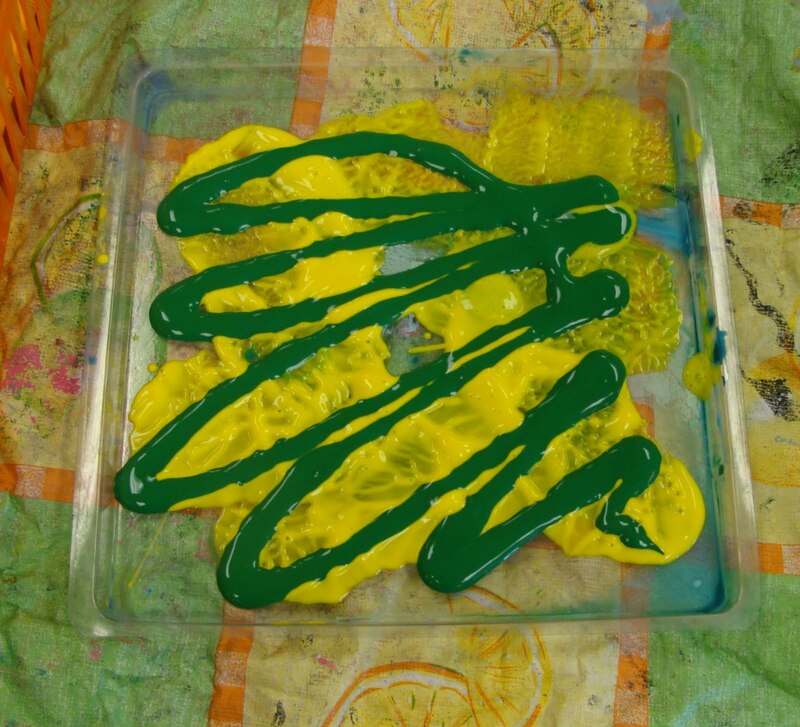 Add some green paint to the tray and have the students repeat step 2. 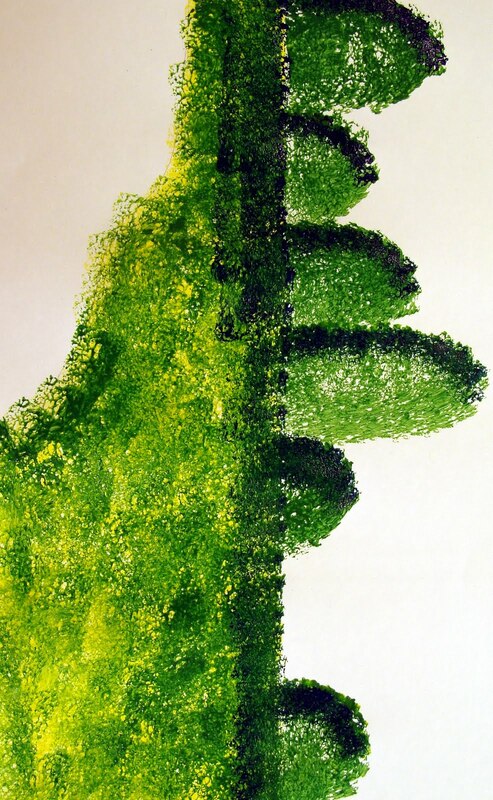 Add some bushes above the horizon line, using the sponge. I have the students leave an open area for a path. Make sure that they don't leave this open space above the pond or their path will go into it! You can also have the students add an arbor or arch over the opening. Add some blue tempera to the tray and have students hop their sponge in the paint to mix the blue in. 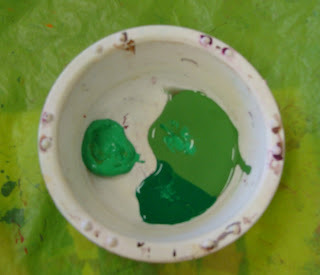 Use this color to hop the sponge across the horizon line to add a shadow. 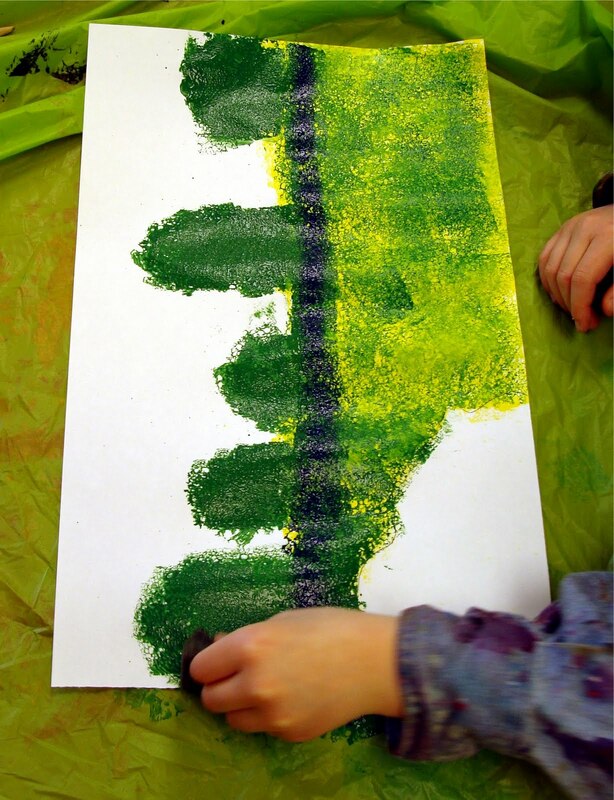 Also, have students add some of this color on one side of each bush to create a shadow on each. 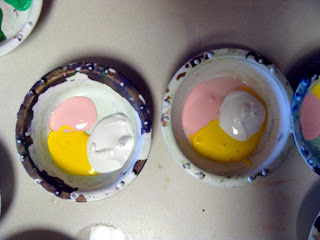 Put some blue and white acrylic in a bowl, side by side. I tell the kids NOT to mix the colors. Rather, they pick up a little of each color to paint the pond. 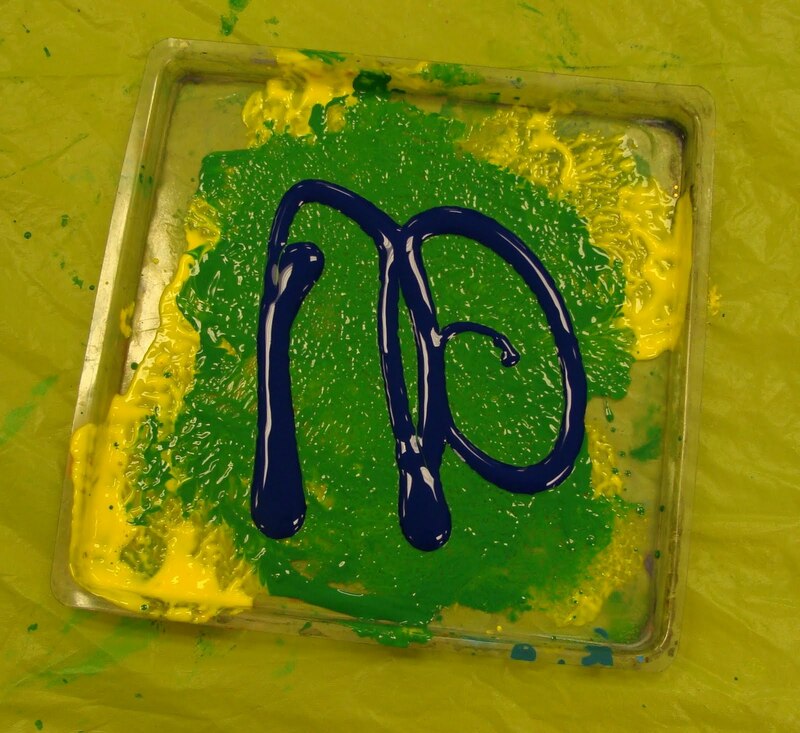 I have them make "waves" in their pond by making small brush strokes. By not mixing the blue & white, they get the effect of the light hitting the water. While the pond dries, I show the kids examples (photos) of lily pads and water lilies. We also discuss that we are seeing the side of the lily pad rather than the top, so the shapes will be a flattened circle, or ellipse. They then add about 3-5 lily pads to their ponds using two colors of acrylic paint. 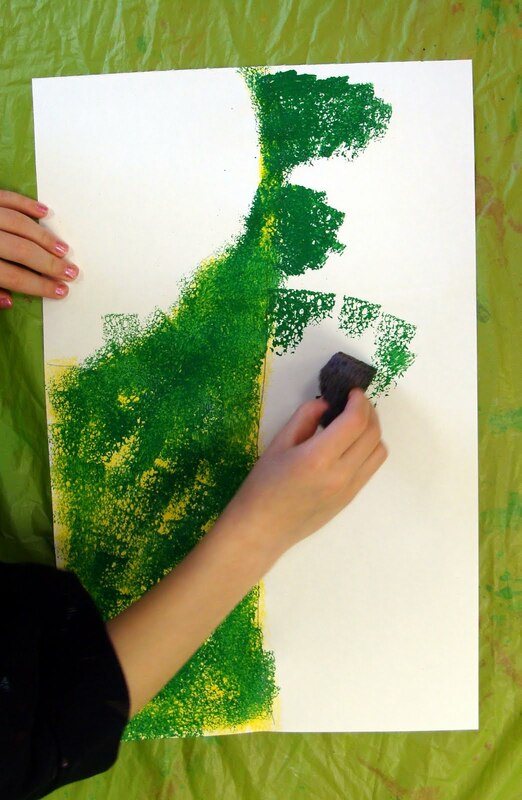 They also add some small flowers to their gardens by dipping the WRONG end of their paintbrushes in various colors of tempera and then dabbing them on the paper. I place some yellow, pink, and white acrylic paint in a cup and demonstrate how to make the water lilies. Have the students dip their brushes in all three colors (without mixing them all together) and then make four brushstrokes as drawn in the diagram, making sure that the strokes connect at the bottom to form the flower petals. Add a cobblestone path leading in to the garden. 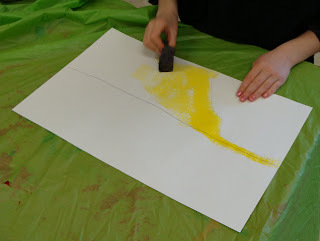 Using the sponge again, dip in to some brown and white tempera, making sure that the colors are not completely mixed together. Have the students use the CORNER of the sponge to make "stones" in the pathway leading in from the arbor. Step 10: Adding the fence- 2 variations. 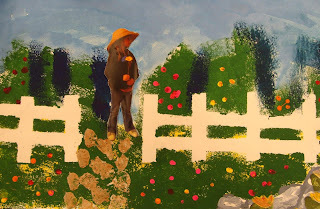 I have had students use two different methods for adding a fence. In the first method, students mask off the area of the fence by tape rolling strips of paper to their white paper in the shape of a fence. Then, complete steps 1-9 before removing the paper strips. The white fence shows through. 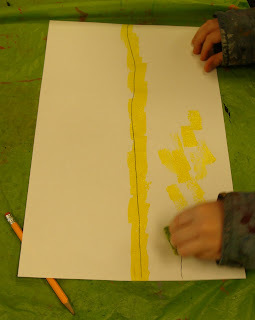 I have had a few issues with this method; the kids have a hard time rolling the tape, the tape can stick out the edges, and sometimes, the paper falls off. But, if done correctly, the fence turns out wonderful, as shown below. Enjoy some of our gorgeous gardens. 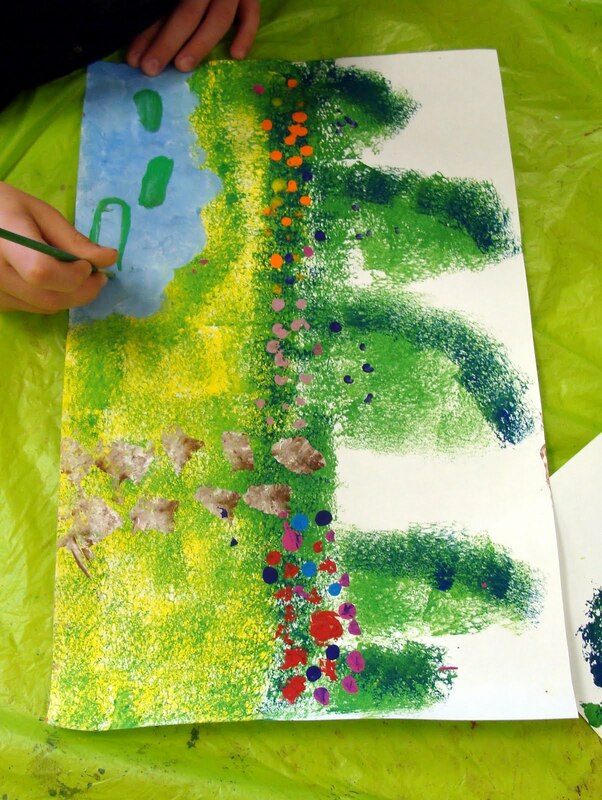 Monet would be proud! A techy twist: take digital photos of the students in front of a green screen, print them, and then cut them out and glue to the painting. Or, add them digitally. I had the kids pretend they were picking flowers or standing with their hats on holding flowers. 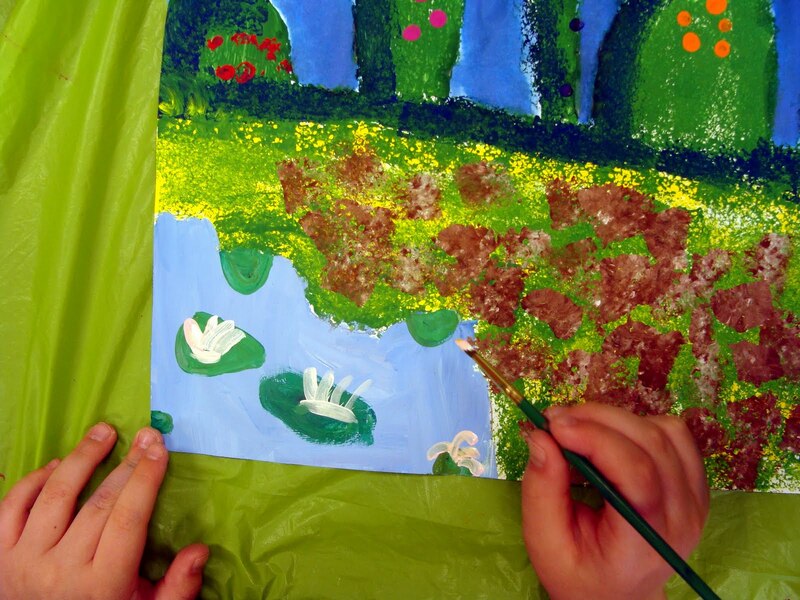 You can see more of our Monet Gardens on Artsonia. They look really lovely. I've done the tape thing before, to make bridges and fences with Monet-style gardens, but it sometimes tore the paper coming off, and kids got upset. We hid the holes by taking scraps of white paper to build fences and/or tissue paper to make clumps of flowers and glued them onto the holes. What a great tutorial. 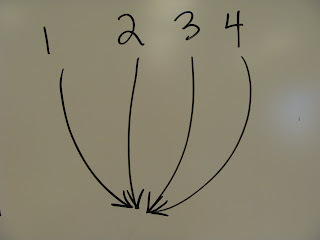 I did this lesson with a fourth grade, and the results were amazing too. 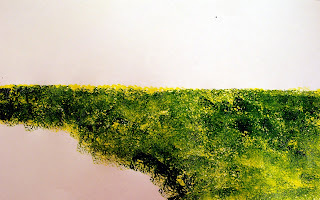 The best tip was indeed not to mix colours, but to dip the brush in two or three colours at once. This gives the real Monet effect. This is a great project! I want to try it with my students. Thank you for sharing. Hi there! I loved this tutorial so much that it made the Weekly Top Twenty at the Art Fairy. Stop by an pick up a button if you get a chance. Recently in a teachers’ meeting, we discussed the ideas of Charlotte Mason. 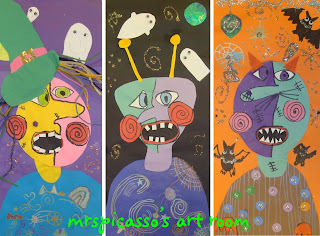 I realized I had not been showing my 1st-6th grade art students nearly enough quality art for them to digest. I sat down and collected pictures of famous paintings and pictures of my friends’ paintings and shared them with my 1st graders. Hey Mrs. Picasso..I just finished this lesson. I couldn't wait for spring. I changed it a little at the end and had the kids paint in whatever color fence, garden path and other details the way they wanted. They still came out great! Thanks for sharing. I linked this blog post to my blog. www.wesbmsarat.blogspot.com you can check out a photo collage there! I did this lesson with my 1/2 class this week and they loved it!! 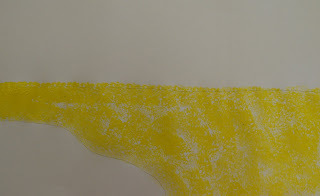 Would love you to check out the photos of their work on my blog. 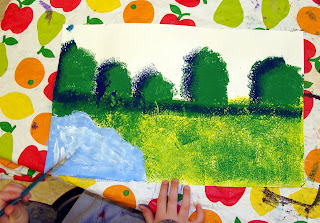 I did this lesson with my kids and would love to link back to your blog. I took your instructions and made a pdf for ease of printing. Would it be ok if I used it (along with a plug for your great blog?) on my post about this project? Absolutely! Looking forward to seeing them! Thank you for the detailed instructions and the inspiration. 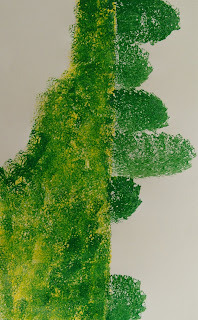 Did this today with my 6 and 4 year old children for a homeschool art project. They loved it and it turned out great!!! Only issue is that the final pictures showed the sky in the background but there was no step for this part in the instructions. Thanks so much for posting!! 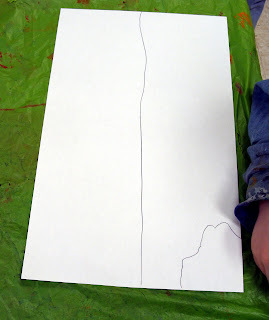 Can you tell me at what point in the directions the students should paint the sky and with what mediums/instructions? Thank you so much! We used liquid watercolor for the sky. You can add the sky anytime after painting the bushes.